We all expected fireworks at the so called “biggest event in UFC history”. I don’t think anyone expected those kinds of fireworks. UFC 229 lived up to the hype, with excitement pervading the night. Unfortunately, all the post-fight discussion has been dedicated to the final few minutes of the broadcast, when all the fights had concluded. Heralded as the biggest MMA fight ever, Khabib vs McGregor headlined in Vegas as fans from all over the world converged on the prize fighting capital. From Irish fans and Russian to fans to celebrities like Matt Damon and Chris Pratt, UFC 229 had that feel. You know the feel I mean. The undercard was not satisfied to merely prop up the collision course main event, everyone looked to steal the show. 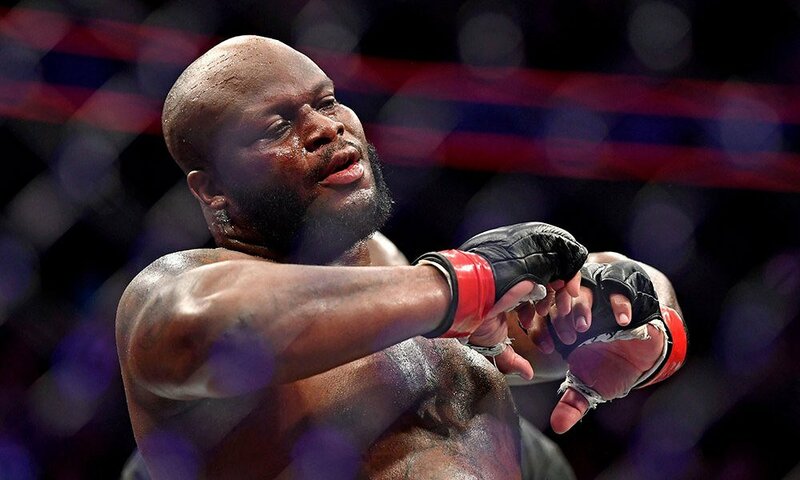 An exhausted and hurt Derrick Lewis was tuned up for three rounds by Alexander Volkov until a late flurry – literally 12 seconds before the end of the fight – felled the giant Russian to take a comeback of the year level victory. The “Black Beast” proceeded to take his shorts off and tell Joe Rogan his balls were hot. Next up Dominick Reyes controlled the ever formidable Ovince Saint Preux for 15 minutes, showing why many believe him to be the future of the light heavyweight division. He scored a knock down right before the final buzzer, with many seeing it as a knockout. It wasn’t recorded as a KO, but regardless, he looked like the real deal throughout the fight. 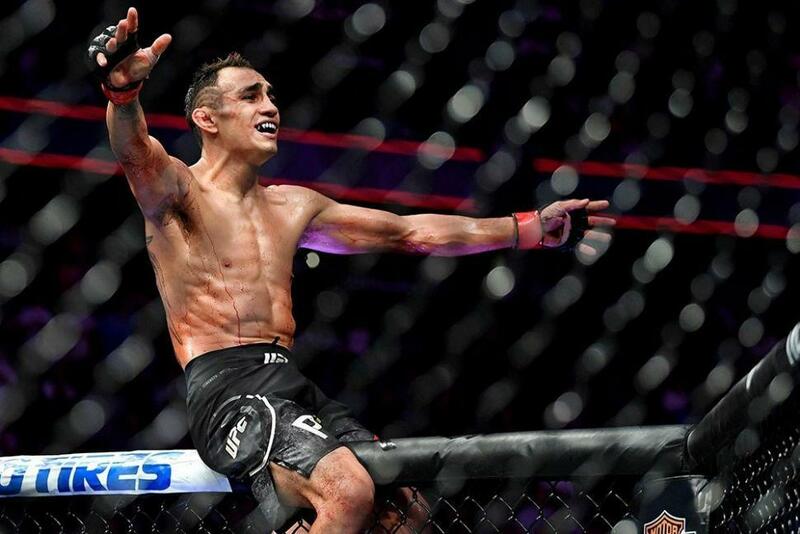 The co-main event saw the return of “El Cucuy” Tony Ferguson to take on 155 mainstay Anthony “Showtime” Pettis. This fight… My word. Ferguson destroyed his knee back in April, returning months before expected. The former interim Lightweight champion, and the man some consider to be the best 155er in the world, doesn’t appear to have lost a step after a year out from the sport. T-Ferg did T-Ferg, marching forward, putting a metric tonne of pressure on the vaunted creative kicker “Showtime”. The first round went the Boogeyman’s way, as he out landed Pettis and rocked him before the buzzer. The second looked to be heading the same way until Anthony Pettis landed a rocket of a right hand over Tony’s low kick that sent him twirling across the cage. Ferguson looked like a pinball as “Showtime” chased him down with stinging punches. Things eventually settled into “El Cucuy’s” closed guard. Somewhere in the chaos Pettis had received a large cut along his hairline, and now both men were drenched in claret. Ferguson eventually created enough space to stand up, prompting referee Jason Herzog to call the doctor in to look at Pettis’ cut. Both men were wiped up and they recentred, a smile painted across each of their faces. Both men came for war, and the crowd were eating it up. The rest of the round saw the pair step into a phone booth and trade blood and leather. Ferguson’s wing chun dummy rounds seemingly payed off for him. The second round ended as Pettis attempted a cartwheel kick, because of course the second round ended as Pettis attempted a cartwheel kick. They returned to their corners and unfortunately Pettis revealed that he had broken his hand. Duke Roufus, one of the best coaches in the game, called the fight then and there, giving Tony Ferguson the TKO victory. Ordinarily this would have been disappointing, but with things the way they are now, I can only commend Duke on his actions. Irrespective of that, Ferguson returns with an excellent win in an instant classic. He looks every bit the fighter he was before his catastrophic knee injury. After Pettis defeated Michael Chiesa at UFC 226 back in July, many claimed that “Showtime” was back after an inconsistent couple of years. Even after this loss we can be even more confident that “Showtime” is indeed back. He fought his heart out – both men did. A short and sweet two verse duet by a pair of warriors that ended with a “play it safe” corner stoppage. A wonderful thing to be able to say, and an even more wonderful thing to have witnessed. Thank you, Tony Ferguson and Anthony Pettis, for your performances. Then it happened. Mostly a mauling from “the Eagle”, although McGregor did have a promising third round. Nurmagomedov submitted “the Notorious One” in the fourth round after unrelenting takedowns and top pressure. It was over, Khabib was the victor and we could all go home happy. Except that didn’t happen because a brawl broke out both outside and inside of the cage. 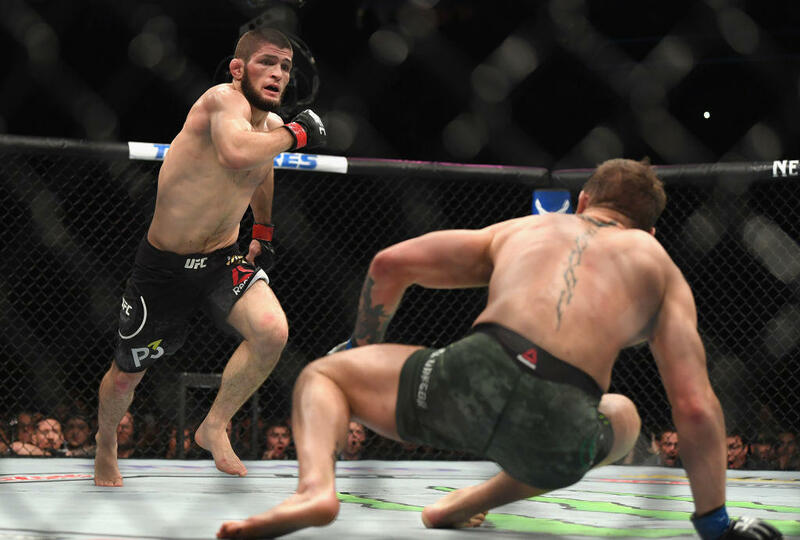 Khabib, apparently reacting to provocations by McGregor corner man Dillon Danis, hopped the fence and executed a Persona style all out attack on McGregor’s team. This eventually spilled back into the cage as McGregor engaged with some of Khabib’s team. It was ugly, really ugly, and poisoned what was an otherwise an amazing night for the sport we love. This seems to be where most people take sides. Everyone wants to point fingers and back up their “team”. Hell, I’m guilty of doing so on Twitter in the immediate aftermath. But in all honestly, the ugliness was there from the word go. Since Khabib got into it with Artem, and Conor launched an attack on a bus full of people. From the press conference to the weigh-in. It was all a nasty affair. It’s easy to get caught up in the excitement of a real rivalry, but this is just sports. An athletic competition at the end of the day. Trash talk is fun, and a useful tool to get into the head of your opponent, but when it becomes about trying to hurt your opponent and those he cares about as much as possible to sell pay-per-views, count me out. When you’re stoking cultural fires, count me out. In hindsight, the build up to UFC 229 was not fun and exciting, it was not the rousing return of MMA’s mainstream star, it was just sad. The first I time have ever personally seen Mixed Martial Arts featured on the front page of a British newspaper was this week. (I don’t pick up a lot of newspapers so take that with a massive pinch of salt). The article did not mention Tony Ferguson and Anthony Pettis’ warrior spirit or Derrick Lewis’s heart and gritty determination. It only talked about an emotional reaction from the champion which resulted in a short flashpoint of chaos to end the UFC 229 broadcast. Khabib gave a world class performance at UFC 229. Unfortunately, the mainstream will likely remember the night for the circus at the end. What a shame. There’s a lot of problems with the sport, but there’s so much to be positive about, so many amazing people doing amazing things. Let’s focus on that.